Saskatchewan has long been recognized as Canada’s breadbasket. But these days, it’s quickly becoming known beyond our borders as the world’s largest producer of plant protein. And that’s drawing the attention of some of the world’s leading agricultural companies. Among them is Singapore-based Agrocorp International, which recently made a significant multi-million-dollar investment in the province. “The Saskatchewan grower has really done a great job of establishing the province as the protein basket of the world,” says Colin Topham, managing director of Agrocorp Processing, the Canadian division of Agrocorp International. In fact, the company sees so much promise in Saskatchewan that it recently moved its Canadian headquarters from Vancouver to Moose Jaw, Sask. In business 26 years, the international trader exports 23 different commodities to more than 30 countries from Saskatchewan alone. Agrocorp has annual revenues of US$3 billion (CAD$3.6 billion), shipping more than nine million tonnes of commodities, while processing 700,000 tonnes of goods at eight facilities located in the world’s largest agricultural producing regions. Two key pieces of Agrocorp’s infrastructure are its Saskatchewan plants in Moose Jaw and Cut Knife that process, clean and size pulse, grain and oilseed products to meet the demands of the global consumer. These facilities processed 200,000 tonnes in 2016, including 100,000 tonnes of lentils, peas, flax and durum wheat in Moose Jaw. 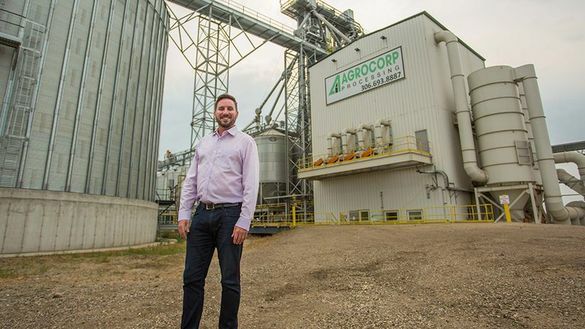 While oilseeds such as canola and grains are important commodities in its Saskatchewan operations, Agrocorp sees the province’s strength in pulse production as the driving force behind its growth. Demand for proteins, starches and oilseeds is rising in lockstep with standards of living in expanding markets such as India, China, Turkey, Bangladesh, Pakistan, Sri Lanka, Indonesia and the Philippines. The international company, with offices in 12 countries, also sees North Africa as an opportunity for expansion. Saskatchewan, however, offers more than just its enormous production capacity for pulses such as chickpeas and lentils. Topham adds that the province is a great place for companies to do business, regardless of industry. The province has a full suite of programs to help reduce the cost and complexity for companies such as Agrocorp that are looking to establish operations. “The specific tax incentives that exist are especially helpful,” Topham says. These include the Manufacturing and Processing Profits Tax Reduction, which lowers a company’s provincial corporate tax rate from 11.5 to 9.5 per cent. Others programs help burgeoning companies in the province connect with global customers, such as the Market Development Program administered by the Saskatchewan Trade and Export Partnership (STEP). The Manufacturing and Processing Investment Tax Credit reduces the cost of doing business by decreasing the provincial sales tax paid. In short, Saskatchewan just might be the best kept business secret in the global agricultural industry, Topham adds. As the first Asian company to invest in the province’s pulse export market and the largest Asian investor in the province’s agrivalue sector, Agrocorp has already spent $20 million on facilities in the province along with hiring dozens of full-time employees. “Going forward, we are expecting to add another 20 jobs in the next few years, and we’ve launched an aggressive capital expenditures program to invest another $20 million in our facilities and additional investments as we continue to expand in Saskatchewan,” he says. This story was created by Content Works, Postmedia’s commercial content division, on behalf of Saskatchewan’s Ministry of the Economy.